Switzerland is one of the most mountainous countries of Europe, with more than 70 percent of its area covered by the Alps, in the central and southern sections, and the Jura, in the north-west. Between the two mountain systems lies the Swiss plateau, about 400m above sea level and some 50 km wide; it extends from Lake Geneva in the south-west to Lake Constance in the north-east. The principal river system is formed by the Rhine and its tributaries. Other important rivers are the Rhône, Ticino, and Inn, and other important lakes are the Lake Maggiore and the lakes of Lugano, Neuchâtel, Lucerne, Zurich, Thun and Brienz. Switzerland is bounded on the north by France and Germany, on the east by Austria and Liechtenstein, on the south by Italy, and on the west by France. Switzerland has a population of 7,700,000 (2008 data) yielding an overall population density of about 186 people per km2. 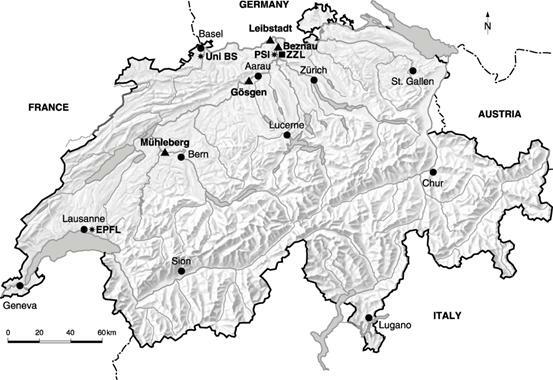 The population is unevenly distributed, with the principal concentrations occurring in the Swiss plateau. The major language communities are: German, French, Italian, and Romansh. Foreigners and their families make up roughly 21 per cent of the population. Switzerland is a nation of consensus, composed of several ethnic groups with a variety of languages and religions. It has been a federal state since 1848. This federal state is organised into three political levels: the communes (2636, 2008 data), the cantons (26) and the Confederation. In Switzerland, the legislature, the executive and the judiciary are separate in terms of their staff, but are only divided in terms of their function. Every four years, the people elect the 200 members of the National Council. All Swiss citizens over the age of 18 may take part in elections, both actively and passively. In other words, they may cast their votes and stand for election themselves. Federal civil servants are required to choose between their profession and elected office should they be elected. In the cantons with more than one seat in the National Council, eligible voters have a number of options to appoint their favourite candidates. Citizens may request that the people decide on an amendment they want to make to the Constitution. At federal level, unlike at cantonal level, it is impossible to request a new law or a new amendment. For such an initiative to be accepted, the signatures of 100,000 voters who support the proposal must be collected within 18 months. Federal legislation, decisions of parliament and certain international treaties are subject to an optional referendum: in this case, a popular ballot is held if 50,000 citizens so request. Referendums also contribute to political agreement because they prompt parliament to include as many interested parties as possible in the debate on new laws or legislative amendments and thereby allow a compromise to be reached that is supported by a majority, and which is unlikely to fall victim to an optional referendum later on. Switzerland covers an area of 41,300 km2, comprising 31% forest and grove, 37% cropland and pastureland, 7% built-up and 25% un-productive land (situation in the mid-1990s). The size of the built-up area more than doubled between 1950 and 1990 and has continued to expand ever since, mainly at the expense of agricultural land. The location in the heart of Europe leads to substantial imports and exports of goods and services, and to transit freight flows through Switzerland. Swiss topography is defined by the Alps. According to the snow and avalanche research institute SLF around 50% of Switzerland’s surface area is higher than 1000 meters above sea level and around 25% higher than 2000 meters above sea level. Furthermore, around 4% of the country’s surface area is covered by water bodies. Climatic conditions, average temperature and precipitation patterns vary significantly across Switzerland, depending mainly on altitude and location. The Alps – running from south-west to east – act as a climatic divide. Measurements indicate a marked shift towards a warmer climate – particularly since the 1970s. Changes in precipitation are less clear, e.g. for annual mean precipitation no significant trends are found in the 20th century. Annual temperature has increased by +1.6°C between 1864 and 2008 which corresponds to a linear temperature trend of about +0.11°C per decade. Temperature trends have accelerated substantially for more recent time periods. Over the last 100 years (1909-2008), annual temperature has increased by about 0.12-0.19°C per decade with no pronounced differences between geographical locations (north-south, low-high). According to an average case, population should grow until 2036, comprising 8’162’000 people. Then the positive population trend should get reversed and begin to decrease. Population should comprise 8’061’000 people in 2050. Switzerland’s real gross domestic product (GDP) grew in the fourth quarter of 2009 by 0.7% compared to the third quarter. The trade balance gave a positive boost to growth. Consumption and capital expenditures also increased. On the production side many industries were able to increase their added value. GDP growth was 0.6% compared to the fourth quarter of the previous year. For 2010, the federal government’s group of experts now expects the economy to grow by 1.4%, a growth rate which is higher than previously anticipated (+0.7%). For 2011, the forecast of a recovery slowly picking up momentum remains unchanged (GDP growth rate around 2%). Nevertheless, relief – i.e. rising employment and a fall in the unemployment rate – is not expected before next year. Source: WEC Member Committees Report, 2006/7 Ed. ** Energy consumption = Primary energy consumption + Net import (Import - Export) of secondary energy. In order to implement this strategy, the Federal Department of the Environment, Transport, Energy and Communications (DETEC) prepared draft action plans for energy efficiency and the use of renewable energy, which were approved by the Federal Council on 20 February 2008. These action plans set out to reduce the consumption of fossil fuels by 20 per cent by 2020 in line with the declared climate objectives, to increase the proportion of renewable energy to overall energy consumption by 50 per cent, and to limit the increase in electricity consumption to a maximum of 5 per cent between 2010 and 2020. From 2020 onwards, the objective is to stabilise electricity consumption. The action plans comprise a carefully conceived package of measures that complement and supplement one another. The package combines incentives (e.g. a bonus/penalty scheme for vehicle tax on new cars), direct promotional measures (e.g. a national programme to promote the renovation of buildings), and regulations and minimum standards (e.g. introduction of a ban on conventional light bulbs in 2012). The action plans include measures for which either the federal government, parliament or the cantons are responsible. Measures for which the federal government or the cantons are not directly responsible are implemented in close collaboration with the relevant actors (e.g. private industry). Increasing the use of renewable energy and enhancing the level of energy efficiency are becoming increasingly important requirements. Especially in view of the finite nature of fossil fuels, the problem of CO2 emissions and the existing high level of dependence on imports, in the long term a shift towards new solutions will be unavoidable. But in order to prevent a radical transition in a few decades, it is essential to already initiate efforts to introduce new technologies onto the market today, in particular technologies for the production of electricity from renewable energy sources. The Electricity Supply Act (effective since 1 January 2008) creates the framework for a phased liberalisation of the Swiss electricity market. The market was partially opened for eligible customers in 2008. Full liberalisation is foreseen for 2014, subject to a facultative referendum. In order to increase the proportion of electricity produced from renewable energy sources an amendment to the Electricity Supply Act introduces compensatory feed-in remuneration to cover the cost of electricity from renewable energy sources. Roughly 40% of Swiss electricity generation comes from nuclear power, with the remaining share mostly derived from large hydropower plants. Switzerland‘s electricity market is highly fragmented. The supply of electricity is assured by some 900 companies, including 7 generation and transmission companies and approximately 80 producers. Many tasks are undertaken by the communes, which also supply water and gas. In some cantons and cities, a single vertically-integrated company is responsible for the entire supply chain, while in other cantons these are provided by a variety of companies. The public sector stake in the capital stock of electricity supply companies is currently around 80%, while the remaining 20% is held by private-sector companies (at home and abroad). Switzerland regulated grid usage in the Electricity Supply Act (StromVG) of 2007. The Act stipulates that the high-voltage transmission grid should be operated by the national grid company, Swissgrid, which guarantees non-discriminatory access to the grid for all companies. The Act also stipulates the unbundling of previously vertically integrated companies. ElCom, the new regulator, is authorised to audit grid usage charges and electricity tariffs and to order reductions in unjustified profits by way of compensation. Since 2009 it has also arbitrated on disputes related to compensatory feed-in remuneration. In 2008, hydropower’s share of total electricity production was 55%, nuclear power contributed 38%. The remainder of 7% is covered by fossil and renewable sources of which waste incineration plants make up 2%. (1) Electricity transmission losses are not deducted. (1) Net import / Total energy consumption. In November 1945, the Swiss government established the independent Atomic Energy Committee with the mandate to advise the government in all civilian and military matters dealing with nuclear energy. In 1946, the Swiss government mandated the Atomic Energy Committee to investigate all aspects dealing with nuclear weapons, i.e. to prepare the necessary measures for protecting army and population against their impact and also to study what would be required to develop such weapons. On 18 March 1957, parliament ratified the IAEA Statute which entered into force on 29 July 1957. In 1969, Switzerland signed the Non-Proliferation Treaty which was ratified by and parliament on 9 March 1977. As early as 1946, Brown Boveri & Cie (BBC), now ABB Group, took the first steps to build up a team of physicists and to launch a development program. BBC was later joined by Sulzer Brothers and Escher-Wyss. Initial studies dealt with graphite-carbon dioxide reactor concepts, but from 1952 on, the development concentrated on heavy water moderated reactors with the subsequent planning of the research reactor DIORIT. In 1955, more than 150 private companies joined forces and formed the company "Reactor Ltd" to build and operate the new privately-owned research centre in Würenlingen, with two reactors on the site: SAPHIR and DIORIT. In 1960, the federal government took over the research centre, known under its abbreviation EIR (Eidgenössisches Institut für Reaktorforschung). In 1988, the merger of EIR and SIN (Schweizerisches Institut für Nuklearphysik) led to the creation of the Paul Scherrer Institute (PSI). In Switzerland, the nuclear age began on 30 April 1957, when the SAPHIR research reactor went critical under the responsibility of Swiss scientists and engineers. This pool reactor had been purchased in 1955 from the US Government, after being exhibited in Geneva during the First International Conference on the Peaceful Uses of Atomic Energy. SAPHIR was shut down permanently at the end of 1993. Decommissioning work, based on a licence granted in 2000, was still under way in 2009. DIORIT, the first reactor designed and constructed in Switzerland, reached criticality on 15 August 1960. It was moderated and cooled by heavy water; the fuel was initially natural uranium; a special loop allowed for the testing of power reactor fuel elements. DIORIT was shut down permanently in 1977. At the end of 2003 all radioactive material was removed from the reactor building. In 1962 saw the construction of the experimental nuclear power reactor in Lucens, a 30 MW(th), 6 MW(e), heavy-water moderated, carbon dioxide cooled reactor located in an underground cavern. Criticality was reached in late 1966 and commissioning in early 1968. In spite of numerous difficulties, the supply consortium led by Sulzer Brothers had demonstrated that Swiss industry was capable of building nuclear plants. The goal was the development of a small to medium-sized power reactor fuelled with natural uranium within a massive containment system. As enriched uranium became readily available during the mid-1960s, the unit size of commercially offered LWR nuclear power plants (NPPs) increased drastically and Swiss utilities started construction of such plants very early on, the interest in the Lucens reactor type decreased and further large expenses for such a development could not be justified. The decision was taken to operate the reactor until the end of 1969; unfortunately, on 21 January 1969, the plant was abruptly put out of service by a partial core meltdown that destroyed the integrity of the primary system and released radioactivity into the cavern. After decontamination, decommissioning and termination of intermediate storage of radioactive material the whole site was prepared for unrestricted reuse in 2003. In August 1965, a turnkey contract was awarded by Nordostschweizerische Kraftwerke AG (NOK) to a consortium made up of Westinghouse International Atomic Power Co, Ltd. and Brown Bovery & Cie for the supply of a 350 MW(e) plant equipped with a pressurised water reactor and two turbo-generators (Beznau). In late 1967, NOK took the option to order a duplicate of the first unit. Beznau I reached criticality by the end of June 1969, and Beznau II in October 1972. In 1965 too, Bernische Kraftwerke AG (BKW) chose a 306 MW(e) plant equipped with a boiling water reactor manufactured by General Electric (GE) and twin turbo-generators from BBC (Mühleberg). In July 1971, full power was achieved, but on 28 July a turbine fire broke out. Sixteen months later the plant was officially handed to the owner. In 1973, a supply contract was signed by a consortium of Swiss utilities with Kraftwerk Union (Siemens) for the delivery of a 900 MW(e) pressurized water reactor and turbo-generator (Gösgen). Construction of the plant went very smoothly until the first connection to the grid in February and 80% power test in March 1979. However, the accident at Three Mile Island on 29 March 1979 led to an 8 month delay in commissioning. In December 1973, a consortium of Swiss utilities and one German utility awarded a turnkey contract to General Electric Technical Services Overseas (GETSCO) and BBC for the supply of a 940 MW(e) nuclear power plant equipped with a boiling water reactor (Leibstadt). Construction began in 1974 and the plant was commissioned in December 1984. The safe disposal of radioactive waste is the responsibility of those parties who produce it, namely the following nuclear power plant operators: BKW FMB Energie AG (Mühleberg), KKW Gösgen-Däniken AG, KKW Leibstadt AG, Nordostschweizerische Kraftwerke Baden – now Axpo (Beznau I and II), Energie Ouest Suisse – now Alpiq. In 1972 the above operators established the National Co-operative for the Disposal of Radioactive Waste (Nagra) together with the federal government (which is responsible for the disposal of radioactive waste from the healthcare sector, industry and research and is represented by the Federal Department of Home Affairs). The nuclear controversy began in Switzerland in 1969 with the first signs of local opposition to a nuclear plant project at Kaiseraugst, near Basel. For 20 years, the Kaiseraugst project was to remain centre stage in the nuclear controversy: Site permit, local referenda, legal battles, site occupation by opponents in 1975, parliamentary vote in favour of construction in 1985, and finally parliamentary decision in 1989 to end the project definitively. The Chernobyl accident of spring 1986 had drastically affected the political climate. Although some of the necessary permits had already been issued for two planned NPPs at Kaiseraugst and Graben, their construction was subsequently abandoned, as well as other projects in Verbois, Inwil and Rüthi. v. In 1999, two new initiatives were organised aiming at the ban of the construction of new NPPs until 2010 and the closure of all NPPs after a 30 year live-span. Both initiatives were rejected in May 2003 by 58.4% and 66.3% respectively. A new Nuclear Energy Act came into force on 1 February 2005. It allowed the possibility of building new reactors, with the possibility of a referendum against their construction; no time limit is imposed on the life of existing nuclear power plant; the general license is maintained. It introduces a 10-year-moratorium on the export of nuclear fuel for reprocessing from 2006 to 2016. It also includes provisions for decommissioning, a concept of monitored long-term geological disposal of radioactive waste that combines elements of final disposal and reversibility, and a system for funding the costs of decommissioning and of radioactive waste management. It simplifies licensing procedures and introduces the general right of appeal. A new Nuclear Energy Ordinance came into force together with the Act. During the 10-year moratorium regarding reprocessing started in July 2006, spent fuel is stored in Switzerland, with a view to later reprocessing or direct disposal. Plutonium and uranium gained from reprocessing of spent fuel that was sent abroad before July 2006 is recycled in Swiss NPPs. The radioactive waste arising from reprocessing of spent fuel is returned to Switzerland. There are as yet no deep geological repositories in Switzerland. For both Low/Intermediate Level Waste and High Level Waste repositories, a site selection process according to the Sectoral Plan procedure for deep geological repositories was started with the promulgation of the Sectoral Plan on 2 April 2008 by the Federal Council. In October 2008 Nagra submitted a list of potential geological siting areas to the authorities. The Swiss Federal Nuclear Safety Inspectorate reviewed these sites proposals and presented the results on 26 February 2010. ENSI approves the six geological siting areas proposed for L/ILW and the three geological siting areas proposed for HLW. At the end of the first stage of the procedure and of a three-month formal hearing, the Federal Council will decide on the further developments in the site selection. Five NPPs are currently in operation in Switzerland. There are three research reactors and two central disposal facilities for radioactive waste. Disposal facilities for radioactive waste are situated in the surroundings of the NPPs too. * UCF (Unit Capability Factor) for the latest available year (only applicable to reactors in operation). + Date, when first major placing of concrete, usually for the base mat of the reactor building is done. Geographical location of Switzerland’s nuclear facilities. The sites of the NPPs are marked by triangles. Experimental and research installations are marked by stars. Facilities for nuclear waste management are marked by squares. Dots mark major cities. In the course of time all Swiss NPPs have upgraded their power capacity. At the end of 2009, the nominal net powers were twice 365 MWe for Beznau-, 373 MWe for Mühleberg-, 970 MWe for Gösgen- and 1165 MWe for Leibstadt-NPP. The power plants of Beznau (Unit 1), Gösgen and Leibstadt have unlimited operating licences. In December 2004 the government granted an unlimited operating licence for Beznau Unit 2. In January 2005 the operator of the Mühleberg power plant applied for removal of the time limit on its operating licence. In January 2008 the Federal Supreme Court decided definitely about a procedural question regarding this application. In December 2009 the Federal Department of the Environment, Transport, Energy and Communications DETEC granted an unlimited operating licence for the operator of Mühleberg. This decision has been appealed before the Federal Administrative Court and can in a later stage additionally be appealed before the Federal Supreme Court. The Swiss government announced a new energy policy in 2007 which includes renewable energies, energy efficiency, energy foreign policy and new large-scale power stations including the replacement of the existing five NPPs. In 2008, the three big electricity companies Alpiq, Axpo and BKW submitted general licence applications for three new nuclear units at Goesgen, Beznau and Muehleberg, all three on existing nuclear sites. It is expected that opponents to the projects will request a referendum, which will not take place before 2013. New nuclear power stations would not be commissioned until the year 2025 or even later. * NPPs are not planned by the government. These are the applications that have been submitted by the operators in 2008. It is important to point out that Switzerland has no nuclear power program supported by the government. Instead it has an energy policy which includes nuclear power as one of the several possibilities, and the Nuclear Energy Act regulates the licensing, construction and operation of NPPs. In Switzerland, nuclear energy is used solely for peaceful purposes, e.g. for producing electricity and for application in medicine, industry and research. The 10-year average annual proportion of nuclear energy used for producing electricity is 39% (up to 45% in winter), which is above the European average of 33%. Switzerland's five NPPs have a total capacity of 3.2 GW, and an annual availability rate of approximately 90%. The owners and operators of NPPs are responsible for fuel cycle planning and decision-making. They make contracts in accordance with national legislation and international agreements. The strategy chosen by the NPP operators includes both the reprocessing and storage of spent fuel, the latter with a view to later reprocessing or direct disposal. The reprocessing takes place abroad (France and UK). Plutonium and uranium gained from reprocessing is used for fuel fabrication and is reused in Swiss NPPs. The radioactive waste arising from reprocessing is returned to Switzerland. A dry storage facility at Beznau NPP (ZWIBEZ) and a Central Storage Facility (ZZL, operated by ZWILAG) have been built for the interim storage of spent fuel and radioactive waste returned from reprocessing abroad. In addition, a facility for the wet storage of spent fuel at Gösgen NPP was commissioned in 2008. The Nuclear Energy Act and the Ordinance on the Decommissioning Fund and the Waste Management Fund (7 December 2007) form the legal basis for these two funds. The NPP Operators submit applications in order to start the application procedure. The organisations involved in new NPPs are AXPO (Ersatz Kernkraftwerk Beznau AG), BKW (Ersatz Kernkraftwerk Mühleberg AG) and Alpiq (Kernkraftwerk Niederamt AG). The Federal Council is responsible for decision making regarding the application for general licence. The decision of the Federal Council will be brought before parliament and is then subject to an optional referendum. The Swiss government consists of the seven members of the Federal Council who are elected by the United Federal Assembly for a four-year term. The Federal Department of the Environment, Transport, Energy and Communications DETEC is responsible for the decision making regarding the application for Construction and Operating licence. Its decisions can be appealed to the Federal Administrative Court, and at a later stage to the Federal Supreme Court. More than 1700 people work within DETEC (including its agencies like SFOE). The Swiss Federal Office of Energy SFOE has the lead on all three authorisation procedures. The SFOE employs approximately 155 staff. As of the beginning of 2010, the SFOE comprises four divisions and two operational sections. The Swiss Federal Nuclear Safety Inspectorate ENSI is the national regulatory body with responsibility for the nuclear safety and security of Swiss nuclear facilities. In the licensing procedures it is also responsible for safety-related examination and assessment of the facilities. ENSI’s annual budget is in the order of CHF 40 million (i.e. about EUR 26 million). Most of ENSI’s expenses are covered by fees which licence holders have to pay to the federal government. ENSI currently employs 115 staff: physicists, mechanical, electrical and civil engineers, geologists, chemists, biologists and psychologists, in addition to technical and administrative personnel. Other public entities involved in the above mentioned authorisation procedures are the Swiss Federal Nuclear Safety Commission NSC, the Federal Office for the Environment FOEN, the Federal Office for Spatial Development ARE and the cantons. No government financial support is granted for the construction of new NPPs. Some public entities, such as the cantons nevertheless have considerable shares of some of the relevant companies. New NPPs in Switzerland would not be commissioned until the year 2025 or even later. Grid expansion may be necessary depending on the actual projects and the location. No further details can be given at the moment. On 9 June 2008, Kernkraftwerk Niederamt AG, a subsidiary of Atel Holding AG (now known as Alpiq Holding AG), submitted an application to the Swiss Federal Office of Energy (SFOE) for a general licence for a nuclear power plant with a maximum output of 1,600 MW. The plan is for the new facility to be constructed in Niederamt (canton of Solothurn) near the existing Gösgen NPP. On 4 December 2008, on behalf of Axpo Holding AG and BKW FMB Energie AG respectively, Ersatz Kernkraftwerk Beznau AG and Ersatz Kernkraftwerk Mühleberg AG each submitted an application to the SFOE for a general licence for the construction of new NPPs to replace the existing Beznau I, Beznau II and Mühleberg facilities. The plan is for these new NPPs, each with a maximum output of 1,600 MW, to be constructed at the locations of the existing facilities, namely in Beznau (canton of Aargau) and Mühleberg (canton of Bern). All three applications are currently being examined in detail by the Swiss Federal Nuclear Safety Inspectorate ENSI. An Environmental Impact Assessment will be conducted by the Federal Office for the Environment FOEN in the first half of 2011, albeit only after the study by ENSI, and the statements of the NSC and the cantons have been submitted to the SFOE. No commercial NPP is in the decommissioning process. Natural uranium is currently procured from three sources: partnership or joint-venture production, long-term contracts and spot market contracts. Enrichment is provided by the USA, Russia and countries of the European Union (France, Germany, United Kingdom, the Netherlands). The fuel elements are manufactured in the USA, countries of the European Union (Belgium, Germany, United Kingdom, Spain, Sweden) and Russia. Under Swiss legislation, the utilities are free to choose between reprocessing and direct disposal of the spent fuel. The Nuclear Energy Act sets out a series of conditions which must be fulfilled for an authorisation for the export of spent fuel for reprocessing to be granted. The conditions include an international agreement with the country of destination, the existence in that country of an adequate facility corresponding to international standards and the ratification by that country of the Convention on Nuclear Safety and the Joint Convention. Furthermore, the shipment of spent fuel for reprocessing abroad is not allowed for a period of 10 years which started in July 2006. The management (handling and storage) of radioactive waste is governed by the provisions of the Nuclear Energy Act and the Nuclear Energy Ordinance, both of which entered into force on 1 February 2005. The management of radioactive waste originating from medicine, industry and research is governed by the Radiological Protection Act and the Radiological Protection Ordinance both of which entered into force on 1 October 2004. All radioactive waste is to undergo storage in repositories situated in suitable geological formations; near-surface disposal is not allowed. Since no repository is yet available, all radioactive waste is stored in interim storage facilities. · All Swiss NPPs have on-site installations for the conditioning and storage of their own operational waste. · This facility operated by the ZWILAG company in Würenlingen features storage buildings for spent fuel and all kinds of radioactive waste, conditioning installations and a plasma furnace for melting and incineration of low level waste. · It consists of a hall for low level operational waste and a hall for the dry storage of spent fuel. · An additional spent fuel pond on the site of the Gösgen nuclear power plant. It is intended for independent operation over several years after the future shutdown of the Gösgen nuclear power plant. · These installations for radioactive waste from medicine, industry and research are operated by the Paul Scherrer Institute (PSI) in Würenlingen. The responsibility for radioactive waste management lies with the waste producers. Legislation requires in principle that radioactive waste produced in Switzerland be disposed of in Switzerland. The option for the disposal of radioactive waste within the framework of a bilateral or multilateral project is kept open, but not actively pursued. Two repositories are foreseen, one for short-lived low and intermediate level waste (“L/ILW”) and the other for high level waste and spent fuel as well as long-lived intermediate level waste (“HLW”) mainly from reprocessing. The site selection process has to follow a sectoral plan procedure within the framework of the spatial planning legislation. The site selection process according to the Sectoral Plan procedure for deep geological repositories was started with the promulgation of the Sectoral Plan on 2 April 2008 by the Federal Council. The SFOE is managing this procedure, which will lead in around ten years’ time to the designation of sites for each waste category. The procedure allows the coordination of a broad range of actors and is divided into three stages. With regard to the first stage of the site selection process, Nagra submitted its proposals for suitable geological siting areas for the repositories for HLW and L/ILW to the SFOE on 17 October 2008. ENSI has reviewed Nagra’s entire documentation and concluded that the procedure followed by Nagra in preparing the proposals for the geological siting regions was transparent and reproducible. Bözberg (canton Aargau), Jura-Südfuss (canton Solothurn and canton Aargau), North of Lägeren (canton Zurich and canton Aargau), Südranden (canton Schaffhausen), Zürcher Weinland (canton Zurich and canton Thurgau) and Wellenberg (canton Nidwalden and canton Obwalden). All these sites have clay-rich sediments as potential host rocks. These include the Opalinus clay, the Brauner Dogger, the Effingen Beds, and the marl formations of the Helveticum. ENSI also approved the three geological siting areas proposed for HLW: Bözberg, North of Lägeren and Zürcher Weinland. All the potential HLW sites have Opalinus clay as host rock. ENSI’s review will be commented by the Nuclear Safety Commission (KNS). After a broad consultation, which is planned for the second half of 2010, the federal government is expected to decide on these potential siting areas in 2011. Once a decision has been reached, the first stage of the site selection process will have been concluded. In stage 2, the proposed siting regions have an opportunity to co-determine the content of storage site projects and participate in studies on the socioeconomic effects and spatial planning impacts. The various sites also have to be compared from the point of view of safety before Nagra can propose at least two sites per waste category. In stage 3, the remaining sites are studied in greater detail from the point of view of site selection and submission of a licence application, and the site-specific geological information is intensified, if necessary by carrying out further geological studies. With input from the siting region, the various storage site projects are defined in greater detail at this stage, and socioeconomic studies are intensified. The waste producers finally submit applications for a general licence (one each for HLW and L / ILW or one for a combined repository). Parliament’s decision concerning the government’s approval of the general licence for deep geological repositories is expected around 2017/2019. That decision is subject to an optional national referendum. A deep geological repository for L/ILW is expected in 2030 and a deep geological repository for HLW in 2040. The Paul Scherrer Institute, PSI, is the largest research centre for natural and engineering sciences within Switzerland. Approximately 400 scientists at the Institute perform high-level research in a large variety of scientific questions that can be grouped into three main fields: Structure of Matter, Human Health, and Energy and Environment. Most of these scientists use the Institute's unique large-scale research facilities. By conducting fundamental and applied research, PSI works on long-term solutions for major challenges facing society, industry and science. The scientific results gained at PSI help us to understand the world around us by shedding light on the processes behind various physical and biological phenomena. At the same time, they constitute the basis for novel developments in technology and medicine. PSI operates several large-scale facilities that allow experiments to be performed that would be impossible in smaller laboratories. In many cases these experiments provide decisive clues for solving a particular scientific problem. The facilities are unique in Switzerland, and some of them are the only ones of their type or scale in the world. In order to allow as many scientists as possible to benefit from the opportunities offered by PSI, the Institute provides access to the facilities within the framework of a User Service to researchers from universities, other research centres and industrial companies. Each year, about 2300 researchers in these categories perform experiments at the facilities. Most researchers working in the Structure of Matter field are investigating the properties of various materials by determining how the atoms they are composed of are arranged and how they move. PSI's particle physicists go one step further and investigate the properties of the smallest building blocks of matter – the elementary particles. The goal of PSI's energy research is the development of technologies for a sustainable use of energy. This includes environmentally friendly energy production, the application of renewable energy sources, and low-loss energy storage. In addition, technologies are investigated which will contribute to the safe use of nuclear energy. Environmental research is concentrated on the study of processes taking place in the atmosphere. About 10% of the PSI’s annual government funding of CHF 244 million in 2009 was earmarked for nuclear energy research. The PSI’s government-funded nuclear energy research activities have been reduced by more than half over the past two decades. To a large extent this reduction was compensated by external funding. With the current staffing quota per year of about 185 person-years (plus about 30 PhD students), and about CHF 7m to 8m for operations and maintenance and investment costs, a balance has been reached. More than 50 per cent of the overall direct costs of nuclear energy research are externally funded by the Swiss Nuclear Power Plant Operators, the National Cooperative for the Disposal of Radioactive Waste (Nagra), the Swiss Federal Nuclear Safety Inspectorate (ENSI) and other national and in particular international agencies (inter alia EU and OECD/CSNI). Most of this support is for long-term research contracts. About 50 per cent of the nuclear energy research at PSI concentrates on reactor safety and safety-related operational aspects of Swiss NPP and on nuclear waste disposal. With nearly 20 per cent of the resources, future reactor concepts, in particular their safety features, which rely on inherent safety mechanisms and on passive system layouts are investigated (to a limited extent through an active partnership of PSI in the Generation IV International Forum (GIF). The NES department is structured into five research laboratories according to its specific scientific and technical areas of competence. It operates the only Hot Lab in the country, and the Reactor School offers education and training programs for present and future reactor operators. The STARS program is a long-standing project aimed at the development, maintenance and application of a complex code and database system to be used for investigations on the behaviour of the Swiss nuclear reactors. Focus areas include combined system transient and uncertainty analysis, fuel modelling and neutronics. The main focus in the HRA (Risk and Human Reliability) is related to the solution of current and future issues concerning the handling of human factors in the context of Probabilistic Safety Assessment (PSA). In the LWR-PROTEUS program, measurements are being taken of basic reactor physics data for modern, complex fuel bundles in a critical facility (PROTEUS). The data collected are subsequently used for the validation of computer codes, and the reduction in their uncertainties. The Nuclear Fuels program involves micro-structural/micro-mechanical examination of the ageing of core internals (fuel rods, structural materials), and the development of associated theoretical models. In particular, investigation of fuel damage and identification of possible causes of failure are also being carried out. Methods for the production of Gen IV fuels, and their associated fuel cycles, are also under consideration. The Component Safety program (INTEGER) involves the experimental characterisation of important ageing mechanisms (stress corrosion cracking, thermal fatigue and irradiation embrittlement) in primary pressure boundary components, the development and validation of advanced mechanistic material ageing models and probabilistic methods for improved integrity assessments and lifetime predictions, as well as the evaluation of advanced non-destructive techniques for the early detection of fatigue and stress corrosion crack initiation and for the characterisation of the actual degree of embrittlement in components. The Source-Term Evaluation program activities are centred around the ARTIST test facility, which reproduces, at reduced scale, aerosol deposition behaviour during a severe accident following a postulated steam generator tube rupture. General considerations of iodine chemistry are being investigated, with specific application to NPPs. The experimental program is balanced by the development and validation of numerical models, the overall theme being aimed at replacing the existing empirical models by mechanistic modelling using CFD. All activities are directed towards source-term evaluation relevant to the Swiss NPPs. This program is an ongoing commitment, overseen by the federal government, to ensure the safe disposal of radioactive waste from the medical and nuclear industries, but also including that arising from nuclear research. The activities cover fundamental waste-disposal chemistry, the physics and chemistry of radio nuclides, and investigation of the geological boundaries for radionuclide transport. Results will ultimately find use in the comprehensive application of safety criteria. This R&D program is carried out in close co-operation with Nagra, the organisation charged with the disposal of all Swiss radioactive waste. These activities are carried out within the Laboratory for Energy System Analysis (LEA) which is an interdisciplinary laboratory supporting both NES and the General Energy Department (ENE). The Laboratory aims to contribute to effective decision-making on long-term technology strategies in energy supply and demand by ensuring the full integration of all environmental, economic and social factors. LEA also develops methodologies, and carries out the associated risk analyses, within the framework of the Human Reliability Assessment (HRA), the program is also part of LEA. The Technology Assessment (GaBE) program involves analyses of fossil, nuclear and renewable energy technologies. It is based on an interdisciplinary framework, thus enabling comparisons to be made between current and future options for the electricity, heating and transport sectors. In the Energy Economics program, analyses are undertaken of energy systems, and associated technological changes, at the Swiss, European and global levels, all aimed at improving understanding of available options for the realisation of more sustainable energy mixes for the future. The Hot Laboratory (Hot Lab) is the largest nuclear research facility under the supervision of the Swiss Federal Nuclear Safety Inspectorate (ENSI), and the only Swiss research facility capable of examining large quantities of radioactive materials. The two main tasks of the Hot Laboratory Division are to ensure a safe and efficient utilisation of the Hot Lab infrastructure, and to conduct state-of-the-art service work for the Swiss nuclear industry. Accordingly, AHL offers Hot Lab users modern analytical tools for the manipulation and investigation of radioactive materials. In particular, the laboratory is very well equipped for structural and chemical analyses of the materials used in NPPs and accelerator facilities. The ALPHA program provides confirmation of the characteristics of passive safety systems for advanced LWRs, and is centred around the large-scale, integral test facility PANDA. More recently, the experimental base has been broadened to incorporate investigations of fundamental phenomena in both the primary circuit and containment, and includes the study of two-phase flow phenomena (such as bubbly flows), the prediction of critical heat flux, and mixture/stratification phenomena. A number of additional small- and medium-scale, single-effect test facilities are now also included under the project heading. At all three scales, experimentation is accompanied by the development and application of novel instrumentation techniques able to measure the distributed parameters characteristic of 3D flow fields. In parallel, there is an ongoing development and validation program for the accompanying numerical tools, particularly CFD (Computational Fluid Dynamics), but including also multi-scale modelling approaches to basic phenomena such as boiling. In the appropriately named FAST program, activities are aimed at the development and implementation of a code system representing state-of-the-art safety analyses of nuclear systems incorporating fast neutron spectra. The High-Temperature Materials program activities involve characterisation of materials to be used in the future Generation IV reactors (particularly gas-cooled reactors), which will operate at significantly higher temperatures, and are subject to a more intense radiation environment than current Gen II reactors. Mechanistic models are being developed for the prediction of material behaviour, from the atomic level up to the scale of the continuum. Experimental validation of the models is also undertaken using advanced spectroscopic methods and, in particular, synchrotron radiation. The European Atomic Energy Community (Euratom) was established in 1957 by the Treaty of Rome. In 1978, Switzerland and Euratom (comprising 15 member states) signed a cooperation agreement in the field of controlled thermonuclear fusion and plasma physics. One aspect of this research cooperation in the medium term is to produce electrical energy by means of fusion reactors. In the field of radioactive waste management, international researches are carried out in the rock laboratories at Mont Terri (canton Jura) and Grimsel (canton Bern). Thirteen organisations from six different countries are jointly carrying out a research program in the Mont Terri rock laboratory. The scope of the project is to determine the properties of Opalinus clay. The partners allocated a budget of CHF 4.46 million for 2008/2009. Swiss partners contributed 36% and the other partners 64%. From 1996 to 2009 the allocated investments amount to CHF 47.5 million. The Grimsel Test Site (GTS) was established over 25 years ago as a centre for underground research and development (R&D) supporting a wide range of research projects on the disposal of radioactive waste, with currently 25 partners from 11 nations coming to work at this unique location. The GTS provides an environment which is analogous to that of a repository site, so allowing the development and testing of equipment, methodology and models under fully realistic conditions. A joint program by EPF Lausanne and ETH Zurich, two of Europe's leading science and engineering schools is offered in order to qualify multidisciplinary professions in industry, research and national authorities. Areas covered include the safe and reliable operation of existing and new reactors, the development of novel reactor types, the sustainable supply of nuclear fuel, the closure of the fuel cycle, the disposal of radioactive waste, and many others. The applications for new NPPs have triggered a new interest and public debate on the subject of nuclear power, along with the issue of nuclear disposal and the enhanced operation of existing NPPs. This is likely to be closely followed by the media over the next few years. Governmental communication is focusing on radioactive waste disposal where efforts to keep the public, stakeholders and neighbouring countries informed has been intensified in the context of the ongoing procedure to identify sites for deep geological repositories. Governmental communication in this field is committed to ensuring a high level of transparency and public participation. Communication on the new NPPs is predominantly led by the initiators and by parliament, which has conducted numerous hearings with all three companies. Governmental communication on the three projects is limited to information about the legal procedures leading to the final decision on the general licence applications by the Federal Council, by parliament, and finally by a nationwide public vote. The Swiss Federal Nuclear Safety Inspectorate (ENSI, formerly HSK) is the national regulatory authority in Switzerland with responsibility for nuclear energy. ENSI has responsibility for the supervision of Swiss nuclear facilities, which includes the NPPs, the interim storage facilities for radioactive waste and the nuclear research facilities. Its regulatory remit covers the entire life of a facility, i.e. from initial project, through the operation and final decommissioning including the disposal of radioactive waste. It also includes the protection of staff and public from the effects of radiation, sabotage and terrorism. In addition, ENSI deals with the transportation of radioactive materials to and from nuclear facilities. The first experimental nuclear reactor in Switzerland was put in to operation in 1957. At that time there was no regulatory authority in Switzerland. Responsible for safety rested with the particular cantons in which a reactor was located. The first nuclear regulator in Switzerland was the Commission for the Safety of Nuclear Facilities (KSA). The KSA was set up in 1960. Until 1982 the secretariat of the Commission evolved in several stages into an independent authority: in 1964 the Federal Council decided to create the Department for the Safety of Nuclear Facilities, ASK. In a regulatory ordinance published in 1982, the Federal Council defined the responsibilities and duties of the regulatory body – by this time known as HSK, the Swiss Nuclear Safety Inspectorate. Until the end of 2008, HSK was part of the Swiss Federal Office of Energy (SFOE). The Nuclear Energy Act explicitly states that the supervisory authorities are independent of technical directives and requests the formal independence of the licensing authorities. With the Federal Nuclear Safety Inspectorate Act the Swiss supervisory authorities (HSK and the nuclear security section of SFOE) were separated from the SFOE and converted into an institution under public law. The new act became effective on 1 January 2009. At the same time, the Swiss Federal Nuclear Safety Inspectorate changed its German acronym from HSK to ENSI, while the English name remained unchanged. Along with this transition, the former Federal Commission for the Safety of Nuclear Installations (KSA) was replaced by the Commission on Nuclear Safety (KNS). The tasks of this new, more streamlined Commission are focussed on fundamental issues of nuclear safety. In the nuclear field, the supervisory authority with respect to nuclear safety and radiation protection is ENSI. In the non-nuclear field, the supervisory authorities are the Federal Office of Public Health (FOPH) und the Swiss National Accident Insurance Office. The FOPH manages the licensing procedures in the non-nuclear field. The following illustration shows the regulatory authority structure for nuclear power in Switzerland.. The following illustration shows the different stages of a licensing process for a NPP. Negotiations with the European Union on an electricity agreement began in 2007 in order to enhance the integration of the Swiss and EU electricity markets. Further negotiations will need to take into account the 3rd liberalization package and the Renewables Directive of the EU. The proportion of electricity produced from renewable energy sources (except large hydropower plants) should attain 5.4TWh or about 10% of the country's present-day electricity consumption by 2030. In the previously monopolised market, companies tended to be vertically integrated, i.e. they performed all tasks along the complete value chain (generation, transmission, distribution, selling and trading).